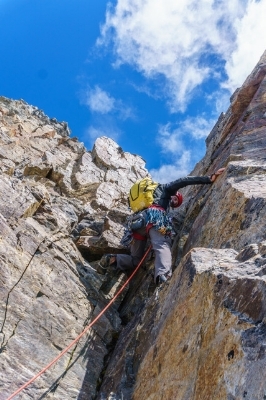 The Cutting Edge podcast brings to life stories from the pages of The American Alpine Journal (AAJ), the annual publication of the American Alpine Club (AAC). Each month, an AAJ editor interviews a world-class climber just back from a wild new route or expedition, with in-depth discussion of the tactics behind the climb, along with the highs and lows of these adventures. The Cutting Edge is produced by the AAC and hosted by Dougald MacDonald, editor of The American Alpine Journal, with additional interviews by AAJ assistant editors Chris Kalman and Andy Anderson. Follow along on iTunes, Soundcloud, or wherever you listen to your favorite podcasts. Special thanks to Jason Burton (www.jasontylerburton.com) for sound effects and original music. Scott Coldiron is that rare and lucky climber who gets to discover and develop an entirely new area: the massive ice and mixed climbs of the Cabinet Mountains in Montana. After a few years of under-the-radar development, 2018 and 2019 have been the biggest years yet on the Thunderdome cliffs and the alpine walls nearby. AAJ editor Andy Anderson gets the full story. Granite Lake, the Thunderdome (center), and A Peak in the Cabinet Mountains. 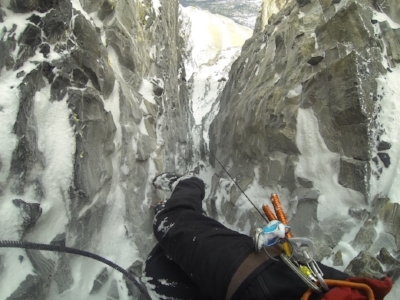 In mid-November, Chris Wright and Graham Zimmerman spent three days on a new route up Mt. Macdonald, high over Rogers Pass in British Columbia. Just getting onto the mountain required years of waiting for the exact right set of circumstances to line up. In this episode, you'll hear about this wild new route (The Indirect American, 1,000m, WI4+ M7), the strategy required, and the two climbers' strong partnership, which will take them back to Pakistan this summer for a second attempt at one of the world's great unclimbed peaks. The Indirect American (about 1,000m high) on the north face of Mt. Macdonald. Chris Wright leading one of the crux mixed pitches on the Indirect American. The alluring ice runnel that caught Wright’s eye seven years ago. Graham Zimmerman got the lead. Zimmerman (left) and Wright on top of Mt. Macdonald. In late September, Hilaree Nelson and Jim Morrison completed the first ski descent of Lhotse, the fourth-highest mountain in the world. Their route was the stunning Lhotse Couloir, a plumb line from the summit down ontto the vast Lhotse Face, right next to Everest. In this episode, Hilaree talks in depth about their preparation and how they made this impressive descent. Above: The team on Lhotse’s summit, with Mt. Everest in the background. 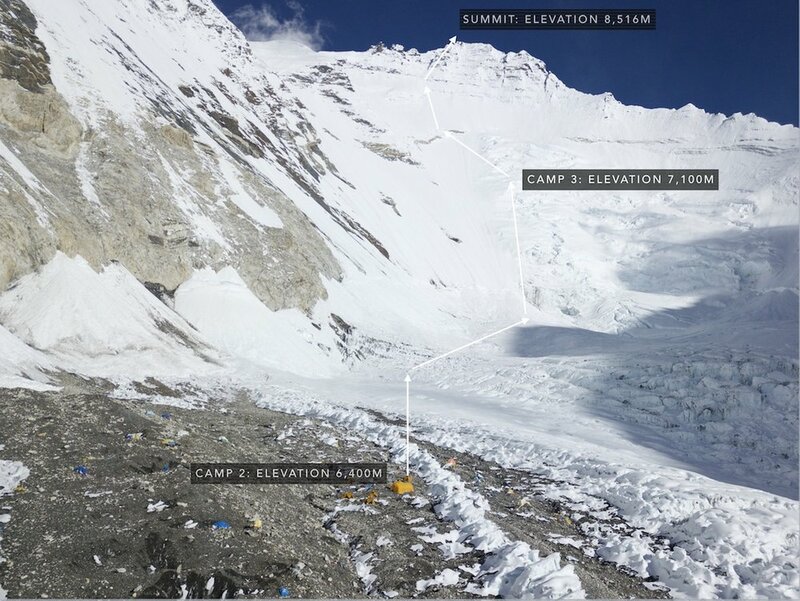 Right: The Lhotse Face and the route from Camp 2 to the top. 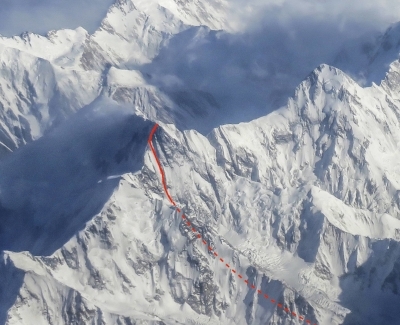 Austrian climber Hansjörg Auer, 34, pulled off a rare feat in July: a solo new route on a 7,000-meter peak in the Karakoram. In this episode, Hansjörg talks with Chris Kalman about his new route on 7,181-meter Lupghar Sar West, the pleasures and perils of soloing big mountains, and that terrifying rappel video that went viral last winter. 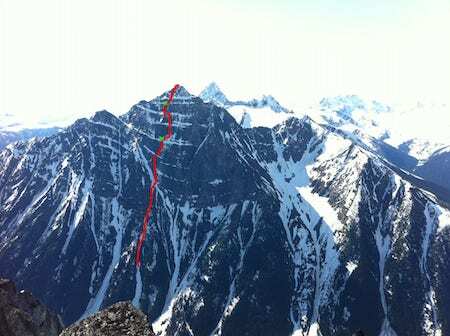 The line of Hansjörg Auer’s solo new route on the west face and upper northwest ridge of Lupghar Sar West (7,181 meters). A delicate traverse to the summit of Lupghar Sar West. Steep, loose terrain on the upper northwest ridge of Lupghar Sar West. After Brette Harrington's partner, Marc-André Leclerc, disappeared during a climb on Mendenhall Tower in Alaska in March, along with Ryan Johnson, Brette felt compelled to return to the Juneau Icefield in southeast Alaska repeatedly last summer, and she climbed numerous new routes in the Mendenhall Towers and elsewhere. In September, she and Gabe Hayden completed a difficult first ascent on the rarely climbed Devil's Paw. In this episode, Brette talks with Chris Kalman about this new route and about how her climbs above the Juneau Icefield have helped her through such a difficult time. Left: Steep rock climbing on the west face of Devil’s Paw. Above: Summit view over the vast Juneau Icefield. Above: The line of Shaa Téix’i (1,300m, 5.11a) on the west face of Devil’s Paw. Right: Brette Harrington. This episode received additional support from Julbo. On August 9, four decades years after the first ascent of Latok I in Pakistan, Aleš Česen and Luka Stražar from Slovenia, along with Tom Livingstone from the U.K., completed the second ascent of this stunning peak (and the first ever from the north side). We spoke with Luka and Tom to get the full story, including their take on the great north ridge of Latok I.
Clockwise from top left: Climbing on the north side of Latok I; the route line followed by the British-Slovenian trio; Luka Stražar, Tom Livingtsone, and Aleš Česen (left to right); digging out at the high camp before summiting Latok I. 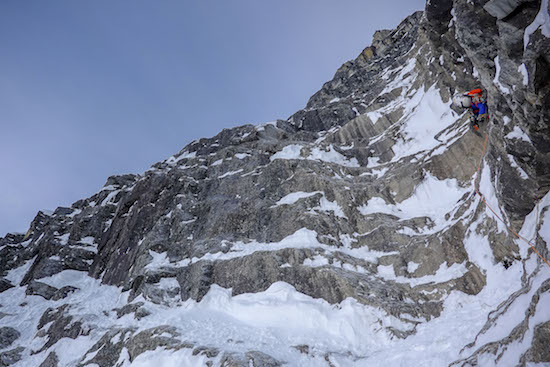 In early June, Colin Haley set a new speed record for the Cassin Ridge on North America's highest peak, soloing the 8,000-foot route in a little over eight hours. In this episode, Colin chats with Andy Anderson about the new record on Denali, his previous speed solos of Mt. Foraker and Mt. Hunter, and the future of climbing in the Central Alaska Range. 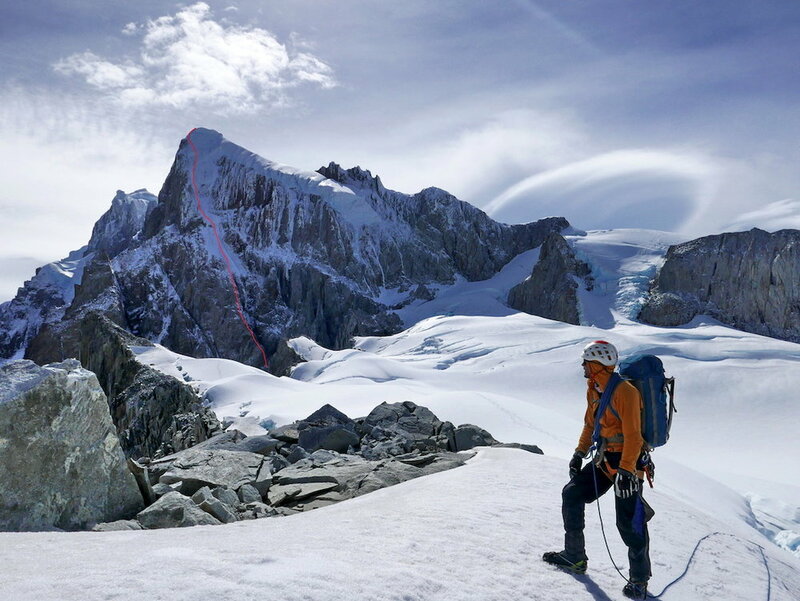 Colin has written in the AAJ about two previous speed solos in the Alaska Range: the Infinite Spur on Sultana (Mt. Foraker) and the complete north buttress of Begguuya (Mt. Hunter). Colin Haley partway up the Cassin Ridge on Denali's south face (above) and looking down a steep section of the route (right). Looking down a knife-edge snow ridge on the Cassin. On the summit of Denali, 8 hours 7 minutes after crossing the bergschrund about 8,000 feet below. Anne Gilbert Chase and Chantel Astorga made the first all-female ascent of one of Denali's hardest climbs, the Slovak Direct, in June. In this episode, Chris Kalman chats with Anne Gilbert about how she got hooked on Denali (she and Chantel attempted this climb two years in a row), the joys of climbing steep ice with a 30-pound pack, and how she feels about first female ascents. Above: Denali's south face. The Slovak Direct is route 6 in the center, just to the right of the Cassin Ridge. At right: Chantel Astorga follows a snow pitch on day three of the Slovak Direct. Chase at the sitting bivouac on Slovak Direct. Chase leading thin ice on the Slovak Direct. In early June, Alex Honnold and Tommy Caldwell not only smashed the speed record for climbing the Nose of El Capitan, they also broke the four-minute mile of climbing: the Nose in under two hours. In this episode, Alex and Tommy speak with Chris Kalman about the preparation and tactics for the climb, the risks of speed climbing, and what comes next. In February 2018, Matteo Della Bordella from Italy and Silvan Schüpbach from Switzerland did the first ascent of a very remote peak on the west coast of Chile in Patagonia. What made their adventure truly exceptional was their "fair means" style, paddling sea kayaks for 100 kilometers to and from base camp, carrying all the food, expedition, and climbing gear for up to a month in the mountains. The AAJ's Chris Kalman spoke to both of them to get the story, including their close call with a tsunami! Marc-André Leclerc died in a climbing accident in Alaska in March, along with Ryan Johnson. Eighteen months earlier, AAJ associate editor Chris Kalman had recorded a long interview with the young Canadian, in preparation for an article that appeared in AAJ 2017. To honor Marc's life and provide a window into his unique character and intelligence, we offer this edited version of the interview, covering bold climbs from Canada to Patagonia. You can read the wonderful AAJ article that Marc and Chris collaborated on here: Two Climbs Alone. 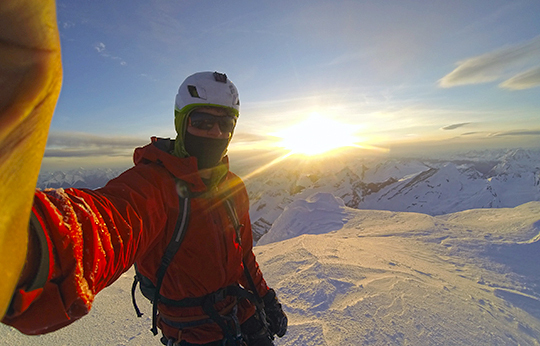 Sunset selfie on the summit of Mt. Robson after soloing the Emperor Face. Looking down one of the crux passages of Infinite Patience on the Emperor Face of Robson. Leclerc on Torre Egger during the first free and integral ascent of Titanic, shortly after his solo ascent. Photo by Austin Siadak. The Emperor Face of Mt. Robson rises about 7,500 feet above Berg Lake. 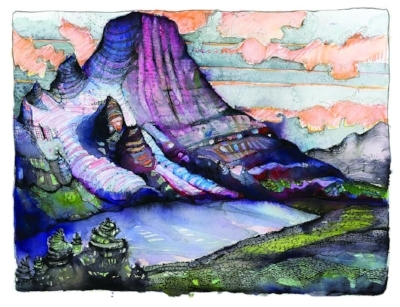 This original artwork was created by Craig Muderlak to illustrate Marc-André Leclerc's article "Two Climbs Alone" in AAJ 2017. Jim Donini first climbed in Patagonia way back in 1974, and in 1976 he made the first ascent of Torre Egger. Now nearly 75 years old, he's still at it, exploring the wild mountains near his summer home on the shores of Lago General Carrera in Chile. Just back from another Patagonia season, during which he bagged yet another unclimbed peak, Jim spoke with AAJ editor Andy Anderson about the beautiful Aysén region of Patagonia, the peaks he's climbed, and his passion for exploration. 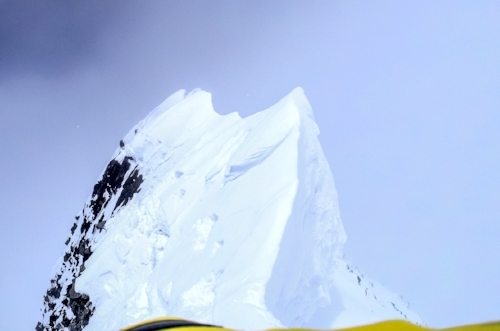 Cerro Chueco, the peak climbed by Jim Donini and Tad McCrea in February 2018. Their route ascended the right skyline. Photo by Tad McCrea. Living the good life on the shores of Lago General Carrera, Chile. Photo by Angela Goodacre. The view from Donini's home in Aysén, Chile, looking across Lago General Carrera. The high peak on the left is Monte San Valentin (4,058m), the highest mountain in Patagonia. 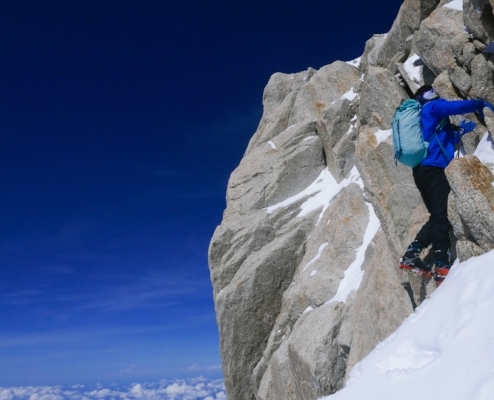 Donini and partners have made the first ascents of two of the peaks on the right. Photo courtesy of Angela Goodacre. Conrad Anker made a dozen trips to Antarctica to climb and guide in the 1990s and early 2000s. But he hadn't been back in over 15 years. In December 2017, after two years of planning, he led a team of North Face athletes to Queen Maud Land, an area of spectacular granite spires, where Anker had done a first ascent in 1996. In this episode, Anker describes the big new route he put up with Jimmy Chin on Ulvetanna, the highest peak in the area, as well as dealing with cold, the team dynamic on expeditions, and the environmental impacts of climbers. Swiss climber Stephan Siegrist has visited the Kishtwar area of India five times in the past seven years, making numerous first ascents. In late 2017, he returned to India with Thomas Huber and Julian Zanker to climb a direct new route up Cerro Kishtwar, an extremely difficult mountain that he had already climbed once before! In this episode, Stephan talks with Dougald MacDonald about Cerro Kishtwar, his climbing partners, maintaining health and motivation for extreme expeditions at age 45, and much more. Siegrist cleaning a stretch of hooking during the six-day ascent of Cerro Kishtwar's northwest face. Challenging aid on Cerro Kishtwar. Some of the pitches took up to six hours to lead, creating frostbite danger for the stationary belayers. Rungofarka (6,495m) is the central peak. The north ridge is a hard-to-see prow in front of the left skyline. The north face is central. Photo by Harish Kapadia. Until 2010, the spectacular mountains of India's Zanskar Range had been off-limits to climbers for generations. This fall, American climbing guides Alan Rousseau and Tino Villanueva took advantage of newly available permits and made the first ascent of a stunning, 21,309-foot peak: Rungofarka. After first attempting the north face, Alan and Tino regrouped and spent four days climbing the north ridge and descending the west side, with about 50 pitches of climbing and difficulties up to M6 WI4+. Andy Anderson, one of the AAJ's associate editors, spoke with Alan about climbing in a former war zone, what went wrong on the first try, the all-time greatest bivy site, and the seductive power of hidden cruxes. The elegant upper crux of the north ridge of Rungofarka, key to gaining the summit slopes. Photo by Alan Rousseau. The dreaded six-inch crack near the end of Day 3 on the north ridge. Photo by Alan Rousseau. This episode of the Cutting Edge is sponsored by Cilo Gear, Grivel, and Beal. Stanhope (left) and Leo Houlding on top of South Howser Tower, 23 hours 36 minutes after starting. In late August, Will Stanhope and Leo Houlding linked the three biggest faces on the Howser Towers in British Columbia's Bugaboos, climbing them all free in 23 and a half hours. Stanhope, 30, a Canadian climber, had been dreaming about this unprecedented enchainment for eight years, ever since he first saw the remote western faces of the Howser Towers. In 2016, he teamed up with Houlding to free a 5.12 route on the Minaret on the west side of the Howsers and to scope the potential for the enchainment. After some rehearsal last summer, the two pulled off the completely linkup, climbing approximately 60 guidebook pitches up to 5.12+, plus complex alpine terrain to move between the towers. The AAJ's Chris Kalman spoke with Will about the planning for the enchainment, how to free climb so much ground quickly, and the primal energy boost from an alpine sunrise after 23 hours on the go. Find this episode on iTunes, Soundcloud, or your favorite podcast source. Will Stanhope cruxing on the Chocolate Fudge Bunnies route on Central Howser Tower. Photo by Adrian Samarra.